Bring Your Concept To a Busy City With Growing Families. SellingRestaurants doesn't get very many large buildings and when we do they go pretty fast. If you are looking for a large venue for your restaurant concept you ought to look at this place. 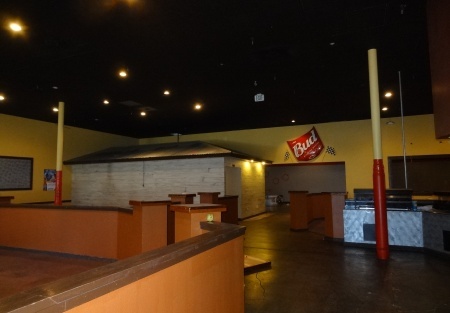 Now a closed Pizza-Sports Bar concept, the old owner was a first time operator, but did a fantastic business with several Telivisions, bars and team rooms. The building is perfect for a Sports Bar concept. You can also serve Buffet, Chinese or Mexican Food and of course, a Pizza Parlor. Hood and Walk-In in place. Needs fixtures. Located in a very busy center on the main street in town, this is one very busy shopping locale. Rent including NNN is $13,000 and the building size is 8738. Building owner might be willing to split off a couple thousand square feet for the right tenant.